Tres Leches Cake with Strawberries is wonderfully soaked with a mixture of sweetened condensed milk, evaporated milk, and heavy cream. On top a layer of freshhly whipped cream and sliced strawberries. Such a great Spring dessert! Get out your lactaid pills, cuz you’re going to need them with this dairy-laden cake. My first attempt at Tres Leches Cake was wildly successful. Thanks to a wonderful Tres Leches Cake with Strawberries recipe from one of my favorite cooking magazines, Fine Cooking , I nailed it. 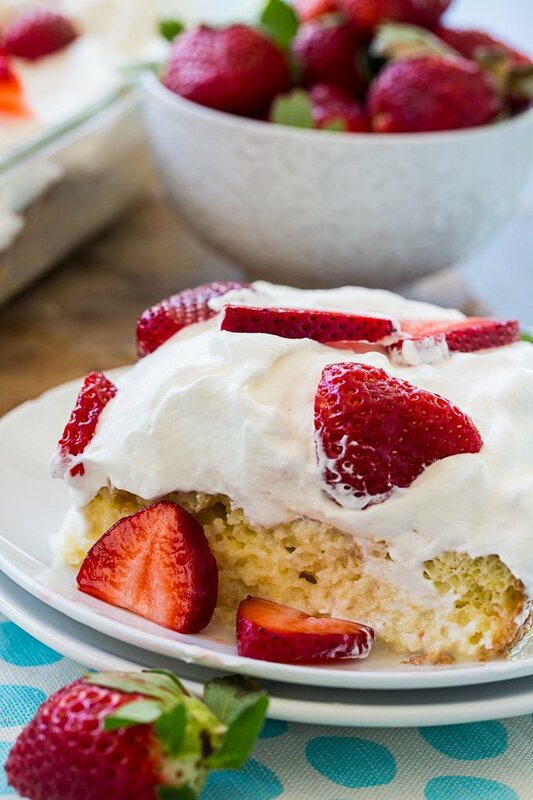 Topped with bright red, fresh strawberries, this Tres Leches Cake is dressed for spring as well as the upcoming Cinco de Mayo. 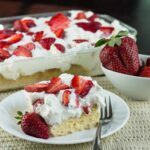 Tres Leches Cake is a little more involved than some cake recipes, but it should be made in advance, giving the soaking liquid time to marry with the cake. This makes it a wonderful choice for a party, pot luck, or cook out. Just pull it out of the fridge and it’s ready to go. Whipped egg whites create a very light-textured cake with tons of air bubbles that are really able to soak up a huge quantity of delicious liquid. 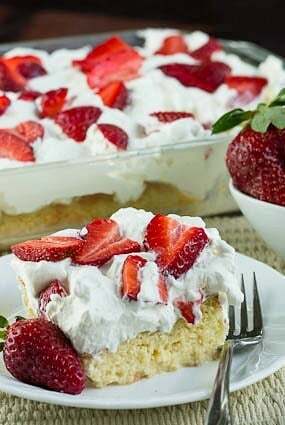 The cake part is exceptionally sweet, as a tres leches cake should be, and it is balanced by a fresh whipped cream topping with just a hint of sweetness. 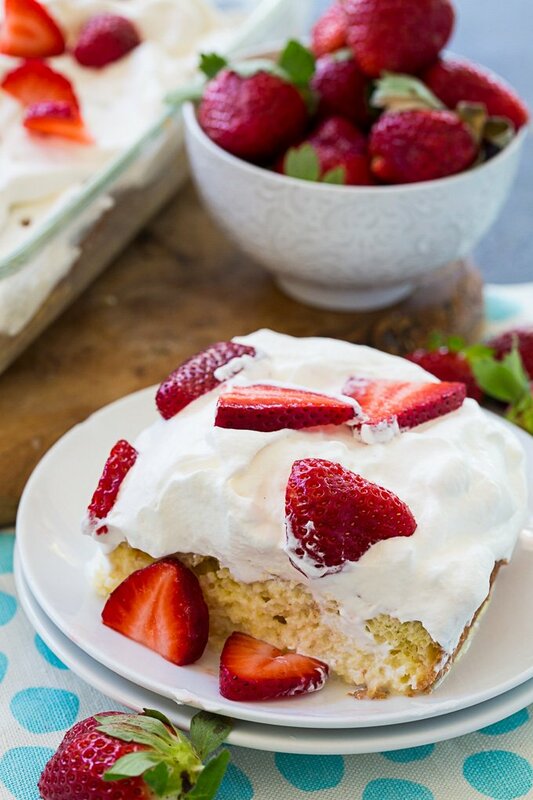 Everyone will love this fresh and bright Tres Leches Cake with Strawberries. Place oven rack in center of oven and preheat to 350 degrees. Butter bottom and sides of a 9×13-inch Pyrex dish , line bottom with parchment paper, and lightly butter parchment paper. Separate the eggs. Place the egg whites in a medium bowl and the yolks in a large bowl. Using an electric mixer, beat the egg yolks and 3/4 cup sugar at medium speed until pale and creamy, about 2 minutes. Add milk and 3/4 teaspoon vanilla and beat until combined. Clean and dry the beaters and beat the egg whites on high until they form soft peaks, 2 to 3 minutes. Add remaining 1/4 cup sugar in a slow stream and continue to beat on high until they reach firm peaks. Whisk 1/3 of dry ingredients into yolk mixture until well combined. Gently fold in 1/3 of egg whites using a rubber spatula. Alternating, fold in remaining dry ingredients and egg whites in two more batches. Pour batter into prepared pan and bake for 20 to 25 minutes, or until toothpick inserted in center comes out clean. Let pan cool on a rack or 10 minutes and then invert cake onto rack and remove parchment paper. Let cool completely and then return cake to baking dish. In a medium saucepan, combine condensed milk, evaporated milk, heavy cream, and pinch of salt. Stir to mix and cook over medium-low heat, while stirring, until it begins to bubble around edges, about 3 to 5 minutes. Remove from heat. Using a toothpick, poke holes in cake at 1/2-inch intervals. Slowly pour milk mixture over cake, starting at edges. Cover with plastic wrap and refrigerate for 2 to 24 hours. In a large bowl, beat heavy cream on medium speed. Add sugar and vanilla when it begins to thicken. Continue to beat until cream forms firm peaks, about 3 to 4 minutes. Be careful not to overbeat. Spread cream over top of cake. Combine strawberries and 1 teaspoon sugar and spread evenly on top of cake. If you don't have unbleached flour, you can use regular all-purpose flour (bleached). This entry was posted in Cakes, Cinco de Mayo, Desserts and tagged cake, strawberries, Tres Leches Cake. Bookmark the permalink. This recipe was SO good. I ended up making the cake/milks a couple days before the day I needed it and made the whipped topping/strawberries the day of and it was absolutely amazing. Thanks for sharing! I made this for Friendsgiving this past Saturday! And it was a BIG hit! I followed the recipe to a T. Left it in the refrigerator over night and frosted it in the morning. People even asked me to make it to sell. LoL. Yay! So glad everyone enjoyed it. Can Cool Whip be used instead of using the whipped heavy cream? Did you pour all the milk mixture over the cake? Seems like a lot. Yes, but make for you just add the 1/2 cup heavy cream to the milk mixture and not the 2 1/2 cups that is for the whipped topping. Tres Leches Cake is very moist and almost has more of a custard texture than cake texture. 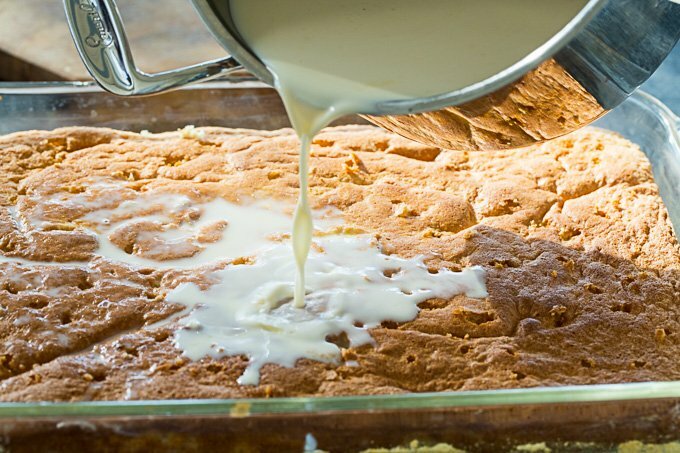 Do you pour the milk mixture over the cake while it’s still hot? The directions don’t specify. The cake should be cooled before pouring the milk mixture over it. I tried this recipe…OMG! Delish! Thanks for putting this recipe up. Next time I want to replace the heavy cream with coconut milk and see how that turns out. Glad you liked it Nathalie! Let me know how it is with coconut milk! I made this cake today for our father’s day picnic tomorrow. I have it in the fridge, and the cake smells awesome! I was just wondering what the best way to do the strawberries is? Do you wait to do the whipped cream/ strawberries till just before serving? I just dont want the cream to get all red from the berries…..
For the best presentation, I would wait to add the strawberries but you can go ahead and do the whipped cream.Sorry if I didn’t answer your question in time. Hope you have a wonderful Father’s Day picnic! We showcase Mouthwatering Collection of World’s Best Recipes to our readers daily. One of my all-time favorites!! Can’t believe you made that! And I wish I hadn’t read the list of ingredients….. I didn’t realize that Tres Leches was one of your favorites.